New Bedford City Hall occupies a historic Renaissance Revival building built in1885-86. It also features the country’s oldest continuously operating elevator, an Otis elevator installed in 1906 — which to this day, anyone can ride. For free. In 2015 New Bedford City Hall sought to update its nearly 40 year old HVAC system which was antiquated, inefficient and unable to effectively cool the building. Siemens Industry, Inc. and Trumbull Campbell Associates, Inc. worked together with the City on this design/build project and recommended an HVAC system that successfully addressed the challenges presented by this historic building. As was customary during the time that this City Hall was built, a courtyard was situated in the middle of the building. An existing remote air-cooled condenser was placed in this courtyard, five floors down from the rooftop. One side of the unit abutted a convex brick wall that housed the historic elevator shaft. This wall could not be touched and, in fact, a distance of 2’ from the wall was needed to maintain the condenser. The drains underneath the unit were clogged leaving the unit submerged in a foot and a half of water. [Figure 1] Most significant, the existing unit was unable to effectively discharge air into the chimney and exhaust it up five floors over the rooftop. As a result, the unit continually operated at high condensing temperatures which made the system inefficient and energy costs high. 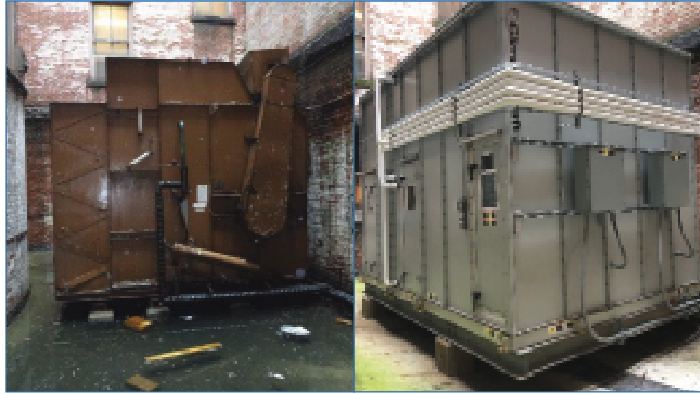 Trumbull Campbell and Siemens recommended that the City replace the old system with a custom ClimateCraft remote air-cooled condensing unit with FanMatrix™ technology. This technology incorporates a modular fan array consisting of multiple, relatively small diameter direct plenum fans. In this case 4 fans were needed to meet CFM requirements, system efficiency and space considerations. 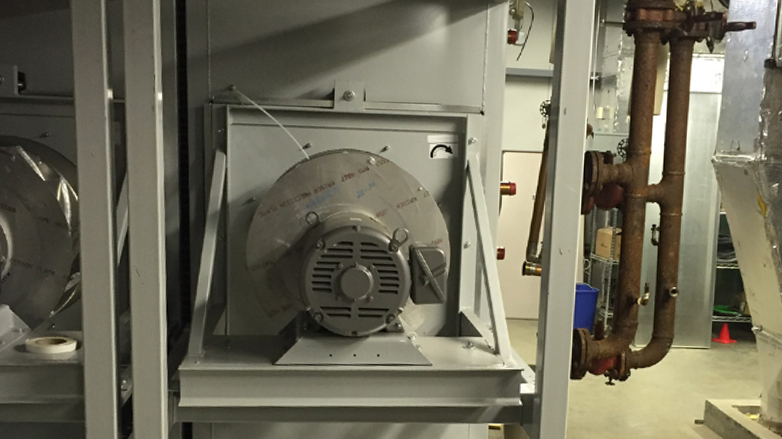 Using the smaller fan wheels inherent in a FanMatrix ™ design allowed the unit to be shortened due to the reduced inlet space requirements, and discharge side length was reduced due to the smaller physical size of the fan assemblies. ClimateCraft effectively addressed both the physical space constraints in the courtyard as well as the issue of the condenser discharge air stagnating and never effectively reaching the top of the building. Moreover, ClimateCraft was able to deliver the unit in three unit pieces. Since the cost of rigging a unit into place correlates with the weight of the unit, the City was able to keep costs down by rigging each piece of the unit separately versus rigging an entire unit. 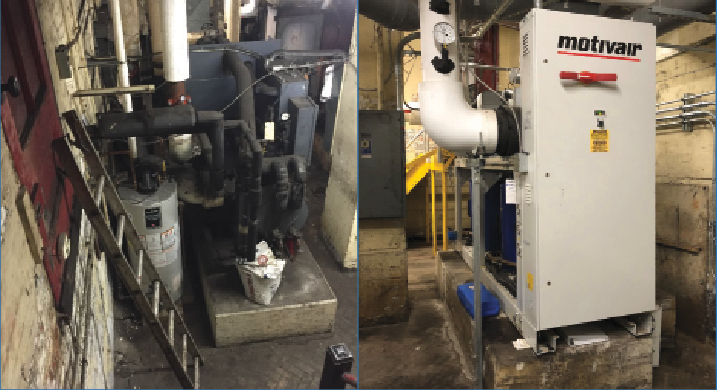 Trumbull Campbell and Siemens also recommended replacing the existing chiller with a remote air-cooled packaged chiller with integral pump package. Motivair custom built the chiller and pump package 31” wide and under 6’ in length so that it could fit with ease through the 36” door and sit on the existing platform. Siemens Industry had specific requirements for where their controls needed to be located so that piping the unit would be easier and more cost-effective. Motivair was able to custom build the unit to accommodate all of these parameters. As a result, energy savings have been realized and indoor air quality has improved. The new HVAC system successfully addressed the space limitations of the courtyard and mechanical room, as well as the air discharge issue, and has worked without issue since its installation two years ago. The City has realized reduced energy costs. The architectural integrity of the building has been maintained, and indoor air quality has much improved. Sign up for updates, insights and news delivered straight to your inbox. Let CosaTron® make a difference with every breath you take.